Well really a one-woman force FOR nature. I first met Pat Rasmussen in 1991 when we were both in Washington DC lobbying the US Congress to save old growth forests. We were Northwests forest activists: She was from Washington state. I grew up in Oregon, but went back east to establish a forest coalition office 2 blocks from the US Capitol in “the other” Washington. In the 25 years I’ve known her, Pat has been a true champion for the environment, travelling around the world, winning campaigns to save old growth forests in Russia, Chile, New Zealand, Australia, and here in the Northwest from Alaska to northern California. Now we both live in Olympia, Washington where she’s dedicated the last ten years to a different more local mission: Turning lawns, pathways , and schoolyards into Edible Forest Gardens (that’s the name of her nonprofit). Each year she miraculously sprouts a new crop of interns and dedicated volunteers, and together they plan food forests – 70 so far – literally thousands of fruit and nut trees, berry bushes and perennial vegetables. I like to say she’s like johnny appleseed, single-handedly feeding the future residents of Olympia – creating a force of nature that will continue to feed and delight our community for decades to come. She’s done most of this donating her own time living on the barest of income, yet somehow always seems happy and fulfilled in the support of her family and community. Pat herself is originally from Wenatchee in Eastern Washington where her family still lives, and where she was once a community college teacher of French, Russian and English as a Second Language. But she gave all that up for the chance to create a better future for all life on planet Earth. In 1994, she took a job as Director of the Alliance to Save the Russian Taiga Forest, and then in 1997 became the Coordinator of the World Temperate Rainforest Network, which involved helping save 10 million acres of temperate Rainforest in Chile. Closer to home, she was President of the local Audubon Chapter where she helped save the old-growth forests of Icicle Canyon, Wenatchee National Forest (see picture). Now at the ripening age of 71, living on Social Security, after decades of service to future generations, she’s not so young any more! Last time I checked, small non-profits don’t offer much in the way of retirement packages. What’s an aging activist to do?? She realized one way she could be comfortable and secure on a small fixed income was to eliminate most of her housing and energy costs! Thus was born her dream of living in a tiny home in her kid’s backyard with hemp insulation and solar panels on the roof. She also knew that many other seniors face a similar dilemma: They want to age in place, in a place they know and love, and be around people they enjoy sharing community with. That might be in their favorite neighborhood, their family’s yard or a tiny home village with other seniors who want to support each other. The DO NOT want to be forced to move to the suburbs, into “a home,” or to live in unhealthy conditions! 11 Tiny Homes for 11 Seniors! Her dream has grown. By inviting ten more seniors to build tiny homes together, Pat is supremely confident she can help create a pathway to a better, more affordable and sustainable future for seniors. I’ve learned by watching, whatever she sets her mind to, gets done. She wants a whole cohort of elders to help build her tiny home. Together, they will learn how to design and build their own tiny homes, and together they will build all eleven. Work parties will involve other seniors and any interested community members. With so many people living on the streets these days, it’s not hard to imagine my dear friend Pat joining the ranks of the houseless, but we just can’t let that happen. She and all of our elders deserve respect, and the comfort and dignity of a safe secure place to live, regardless their economic status or varied paths through life to get to the more vulnerable stage of life they now inhabit. 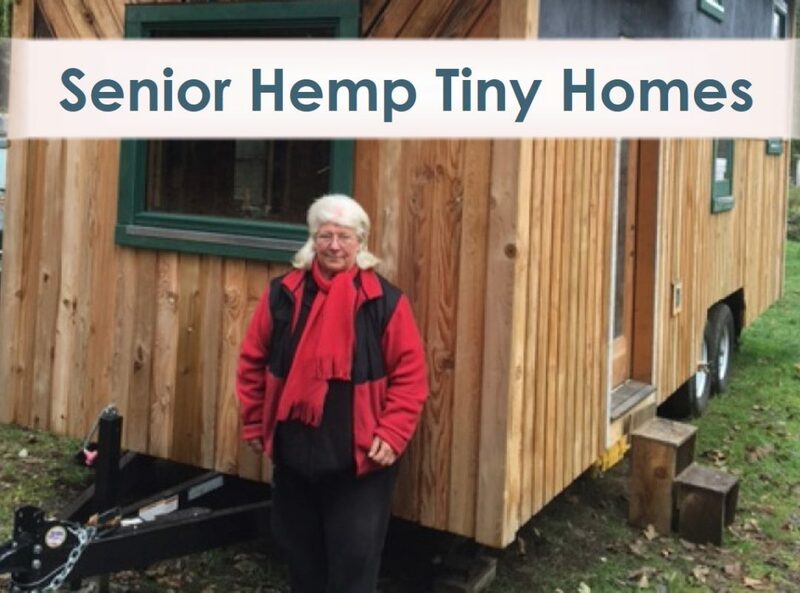 Please join me in donating to the “Help Seniors Build Tiny Houses” project on Gofundme or directly on the Senior Hemp Tiny Homes website. Our goal is $40,000 which will cover the prototype of Tiny Hemp Home for Seniors – a tiny home on wheels – and get her project off to a good start. Coupled with in-kind donations, major donors and grantwriting Pat is going to make this happen!